Interdisciplinary, collaborative and innovative, the MRL is one of the most productive research centers in the world. The MRL operates as an “open” laboratory with shared resources and spaces creating an environment where dialogue can lead to discovery. By actively engaging in productive partnerships with industry, the MRL has proven to be an economic engine here and around the world. The MRL community is dedicated to inspiring a new age of scientific achievement in the United States through collaborative research and outreach to industry, thereby serving as a catalyst to transform people’s lives. These collaborations have, and will continue to significantly impact both the research and educational mission of the MRL. 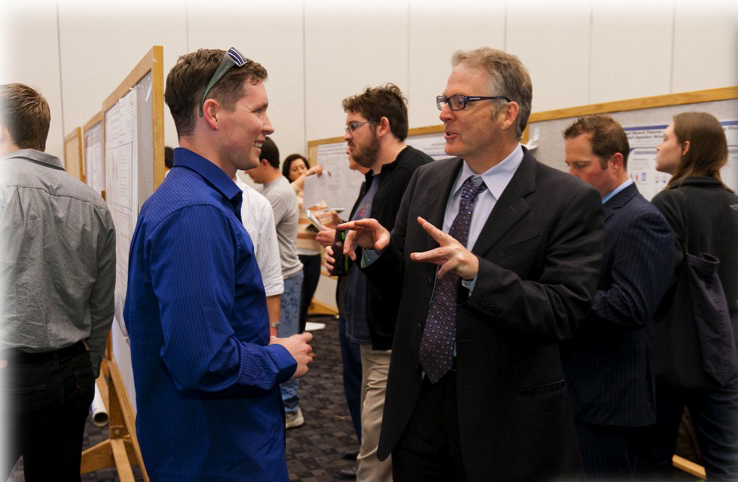 A range of initiatives include: establishing joint research programs and exchanges to enhance the research experience of our students and and post-docs; facilitating industrial interactions through use of the MRL facilities; stimulating interactions with Industry and National Labs that promote MRL/UCSB activities and capabilities in the broadest sense, and; enhancing unrestricted financial support of MRL research programs and to establish graduate fellowships. We actively seek unrestricted gift support from Industry and National Labs to leverage the NSF funding of the IRG and Seed projects and to collaboratively bring this cutting-edge research to the marketplace. The high profile of the MRL and the excellence of the research programs, combined with the annual MROP event and other technology outreach efforts, have proven extremely successful. This impact has also led to the establishment of the Mitsubishi Chemical Center for Advanced Materials (MC-CAM) at UCSB, the Dow Materials Institute at UCSB (DowMI) and the Complex Fluids Design Consortium (CFDC) which is described below. The CFDC is an MRL initiative to create an academic-Industry-National Laboratory partnership aimed at developing computational tools for designing soft materials and complex fluid formulations. The tools are based on the field-theoretic models and computer simulation techniques developed by Associate Director Glenn Fredrickson, who also serves as Director of CFDC. An annual meeting of the CFDC is held in conjunction with our Materials Research Outreach Program.